It's always awkward when you're listening to music on your iPhone and a friend asks to listen too, then you have to share headphones and try to keep your heads from touching. Luckily, the MyStream app solves that problem. 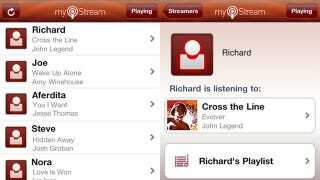 The app allows you to synchronously and wirelessly listen to music and audiobooks with your friends. The developers are treating it as a music discovery app—likely to escape potential lawsuits—so you're presented with links to buy the music you've listened to.